Tenzin Peljor keeps trying to portray the demonstrations by the Western Shugden Society as non-Buddhist and unusual activity for and by Buddhists. 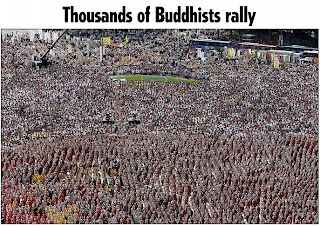 now thousands of Buddhists in South Korea are protesting against religious discrimination. The article regarding the South Korean’s rally can be found here. There is nothing un-Buddhist about demonstrating. Buddha taught that we should do whatever is practical to help correct a situation. Demonstration is a practical method to get your voice heard. The Dalai Lama is harming Dorje Shugden practitioners and destroying Buddhadharma in the process. The Dalai Lama, himself, has brought these demonstrations to his doorstep. The Dalai Lama is engaging in religious discrimination. We will remain calm in our hearts and protest with one compassionate voice for religious freedom, for religious tolerance, and for the remaining of pure Buddhadharma in this world. Dalai Lama – please remove the ban against Dorje Shugden practice! AboutWSS.org – United under the umbrella of the Western Shugden Society, Buddhist Practitioners from all around the world went to Nantes for 3 days of protests against the Dalai Lama. They requested that he stops the persecution and discrimination of Shugden Practitioners around the world and lift the ban on this ancient prayer. AboutWSS.org – Over 500 protesters from the Western Shugden Society marched in unity against the backdrop of a stunning seaside scene chanting with a determined passion: “Dalai Lama Menteur” (Liar). The holiday town was brimming with people who had come to enjoy the national holiday. The intrigued holiday makers stood on balconies, with some people cheering and clapping, as the protesters marched passed. Visit the official Western Shugden Society website for more details. AboutWSS.org – Am impressive convoy of 8 coaches and several mini buses stopped traffic in the seaside town of La Baule today as police escorted hundreds of Shugden practitioners to a march for freedom along the town’s esplanade. 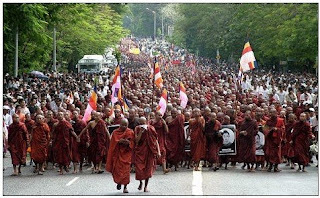 Over 500 people marched in unity against the backdrop of a stunning seaside scene chanting with a determined passion: “Dalai Lama Menteur (Liar). Ganden Lachi and Shartse monasteries are situated at Mundgod in South India. In both these monasteries stands a throne for Kyabje Trijang Rinpoche, the spiritual master of the Dalai Lama. It is quite certain that the thrones will be removed forever from the monasteries in order to appease the Tibetan Government in exile and the Dalai Lama. The Western Shugden Society will be organizing peaceful protests at the Dalai Lama’s teachings in Nantes, France from August 15th-17th. Inside, the Dalai Lama will be giving a teaching entitled ‘Peace through Inner Peace’. Outside, the Western Shugden Society will be asking him to stop his religious persecution of Shugden practitioners in the Tibetan-in-Exile communities and around the world. This blog will be updated with news related to the protests in Nantes, France soon. Western Shugden Society responses to the Australian Sangha Association statement regarding protests at the teachings of the Dalai Lama. Is the Dalai Lama really a champion for peace and nonviolence? In 1996 followers of the Dalai Lama stoned and hurled insults at Dorje Shugden practitioners in Southern India. If the Dalai Lama really was a man of peace and nonviolence wouldn’t he ask his followers to stop their violent actions toward Shugden practitioners? There will be no change in my stand. I will never revoke the ban. You are right. It will be like the Cultural Revolution. If those who do not accept the ban do not listen to my words, the situation will grow worse for them. You sit and watch. It will grow only worse for them. Is the Dalai Lama the Buddha of Compassion? If someone were to claim to us that they were a enlightened being, it would be common sense for us to examine their actions and see whether or not they resembled the actions of an enlightened being. The Dalai Lama is viewed by many to be the Buddha of Compassion. If the Dalai Lama were the Buddha of Compassion surely his actions would be compassionate. This is very clear. So we can ask ourselves the question: Is it compassionate for the Dalai Lama to persecute those who wish to follow their lineage gurus (teachers) rather than him? This is similar to a father beating his children for listening to advice they received from their mother rather than following the father’s advice. His actions of religious persecution do not even resemble the actions of a Buddhist, much less the Buddha of Compassion. His actions are those of a religious dictator. On Monday, July 20th the Western Shugden Society held a second demonstration against the Dalai Lama in Madison, Wisconsin. This video review includes interviews with Tibetan Shugden practitioners, forced to become refugees for the second time in their life as they try to escape persecution.